Win 4 Tickets to Sea Life Grapevine! Don’t Miss The Chance! You are here: Home / Dallas/Fort Worth Events / Win 4 Tickets to Sea Life Grapevine! Check Out The New Sea Turtle Rescue Center Exhibit! Win 4 Tickets to Sea Life Grapevine! Check Out The New Sea Turtle Rescue Center Exhibit! Win 4 Tickets to Sea Life Grapevine! Have you ever been to Sea Life? 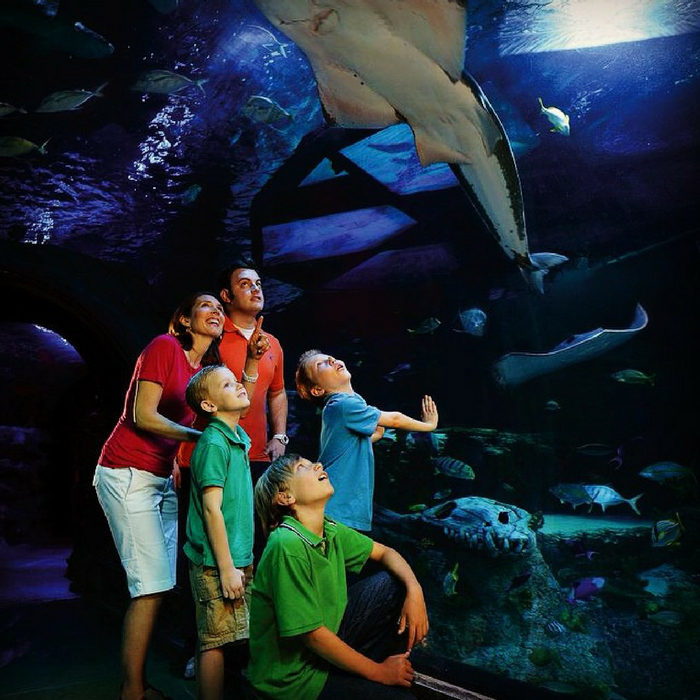 We LOVE Sea life – I particularly love that it is all indoors and air conditioned. In Texas our weather is fierce and to be able to make plans to go to Sea life no matter if it’s raining, freezing, or over 100 degrees is awesome! I was born and raised in Florida and I very much enjoy Sea life because it reminds me of home. I love the beach, ocean, and all of the different species you can see. Sea Life is also so fun and educational for anyone, but, the kids love it, too. They can play, learn, and see the interactive displays and exhibits! Right now you have a chance to win tickets! They gave me 4 FREE tickets for the all-new Sea Turtle Rescue Center Exhibit at SEA LIFE Grapevine opening on May 4. Sea Turtle Rescue Center is a new interactive rehabilitation experience. This new permanent exhibit lets guests of all ages learn about the threats turtles face in the wild and experience first-hand the process of successfully rescuing, rehabilitating, and releasing sea turtles. Upon entry, guests will become a bonafide turtle rescuer as they collect a mock turtle from the beach, name and weigh their patient, then begin a virtual rehabilitation journey. After using an x-ray machine to diagnose and remedy injuries, guests nurse their turtle back to health at the feeding and hydration station then release them back into the wild. In addition to observing non-releasable sea turtles in a display tank, guests can also view aquarists through a glass window working with real injured patients in the aquarium’s new rehabilitation facility and hospital. The Grapevine aquarium is the first SEA LIFE in the U.S. to be permitted to rehabilitate sick and injured sea turtles and release them back into the wild through partnerships with Animal Rehabilitation Keep (ARK), U.S. Fish and Wildlife Service, and other Texas coast sea turtle hospitals. SEA LIFE Grapevine is located at 3000 Grapevine Mills Parkway, Grapevine, Texas 76051. For more information visit www.visitsealife.com/grapevine or call 469-444-3050. SEA LIFE Grapevine transports you into the amazing underwater world. Prepare for astonishingly close views of everything from humble starfish and seahorses to graceful rays and powerful sharks. With an amazing 360° ocean tunnel, 30 display tanks and thousands of sea creatures the aquarium is the perfect stop for family fun. To get any closer you would have to get wet! Admission is $20.95 for adults, $16.95 for children ages 3 to 12. For more information visit www.visitsealife.com/grapevine. SEA LIFE Grapevine Aquarium is located at 3000 Grapevine Mills Parkway, Grapevine, TX 76051. Phone: 469-444-3050. Follow us on Facebook: @sealifegrapevine Twitter: @sealifegrpevine and Instagram: @sealifenorthamerica. MERLIN ENTERTAINMENTS plc is the leading name in location-based, family entertainment. Europe’s Number 1 and the world’s second-largest visitor attraction operator, Merlin now operates 114 attractions, 11 hotels/3 holiday villages in 23 countries and across 4 continents. The company aims to deliver memorable and rewarding experiences to its almost 63 million visitors worldwide, through its iconic global and local brands, and the commitment and passion of its managers and 26,000 employees (peak season). Merlin has twenty-four attractions and one hotel in North America – including two stunning LEGOLAND Resorts – LEGOLAND Florida with its theme park, water park and hotel; and LEGOLAND California theme park with water park, SEA LIFE aquarium and themed hotel; Madame Tussauds celebrity wax attractions in New York, Washington DC, Las Vegas; Hollywood; and San Francisco; LEGOLAND Discovery Centers in Chicago; Dallas/Fort Worth; Kansas City Missouri; Atlanta, Georgia; Boston; Westchester, New York; Toronto, Canada; a Dungeon in San Francisco; and SEA LIFE aquariums in Phoenix, Arizona; Kansas City, Missouri; Michigan; Dallas/Fort Worth; the Mall of America in Minneapolis and Charlotte – Concord – underlining the company’s position as the world’s biggest global aquarium operator. Visit www.merlinentertainments.biz for more information. If you live in the area or plan to visit the area then you might want to enter! To enter the giveaway just leave a comment! That’s it, super simple! There will be 1 winner of 4 tickets! This giveaway will end Thursday, May 3, 2017, at 11:59 pm Central time and the winner will be emailed soon thereafter. Make sure you add [email protected] to your address book, so you get the email if you win! My daughter has become obsessed with sea turtles! I would love to win the tickets so we can take our 2 youngest grandchildren. Our 6 yr old loves nature and anything to do with wildlife. His go to shows are documentaries. Will definitely be visiting. Sea turtles are one of my favorite animals. Thanks for the giveaway!